Long called “Burley and Bright” Half and Half Pipe Tobacco has proven to be well liked with pipe smoking enthusiasts around the world. 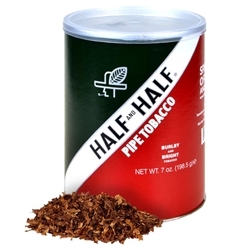 Continuing to deliver a cool burning, flavorful smoke, Half and Half offers a fine quality of domestic Burley and Virginia blend that is always bright, sweet, and mild. Pick up a can or pouch today right here at Smokers Discounts!